A reconstruction of the head of Paranthropus boisei, based on a skull found at Olduvai Gorge, Tanzania, in 1959 by Mary Leakey. Initial analysis of the skull and fossilized teeth led scientists to think this ancestor ate nuts. More advanced analysis in later years revealed that a more diverse diet that included grasses. When scientists want to know what our ancient ancestors ate, they can look at a few things: fossilized animal bones with marks from tools used to butcher and cut them; fossilized poop; and teeth. The first two can tell us a lot, but they're hard to come by in the fossil record. Thankfully, there are a lot of teeth to fill in the gaps. "They preserve really well," explains Debbie Guatelli-Steinberg, a dental anthropologist at Ohio State University. "It's kind of convenient because teeth hold so much information." The structure of a tooth and even the amount of enamel, for example, hint at what the teeth are adapted to eat. Look at molars: Thick enamel on a molar is good for crushing foods. It suggests an animal used its teeth to grind seeds or crush the marrow out of bones. Thin enamel on a molar, while delicate, causes sharp edges — perfect for slicing and tearing foods like leaves and fruits. However, these are just clues to some of the things the animal could have been eating, not what it ate every day, says Peter Ungar, an anthropologist at the University of Arkansas. "If you eat Jell-O almost every day of the year, but sometimes you need to eat rocks ... you want teeth that can eat rocks," he explains. So, teeth are usually adapted for the toughest component of an animal's diet, not what it eats on a daily basis. To see what an animal was actually eating, Ungar studies something called dental microwear, the marks left behind by food on teeth. As we chew on say, a celery stick, hard particles — either bits of silica from the plants' cells or sand and grit from the surrounding environment — are dragged across and pressed into our teeth. When we chomp down on something hard, like a nut, the crushing force leaves microscopic pits behind. When we tear through tough grasses — which may not sound appetizing now, but it's likely some of our ancestors did eat them — by moving our teeth side-to-side, the teeth get tiny, microscopic scratches. "I call it a foodprint," Ungar says. These foodprints can paint a pretty good picture of what an animal ate in the weeks leading up to its death — a sort of last meal. A study of such microwear revealed that Australopithecus afarensis, our 4 million-year-old ancestor best known by the famous fossil of Lucy, probably ate tough grasses and leaves. And it looks like early members of our genus, Homo — like Homo habilis, which lived 2.4 million years ago or Homo erectus, which even overlapped with humans about 100,000 years ago — were omnivores like us. They ate a variety of foods like meat, plants, fruits, "Anything they wanted!" says Ungar. So we can tell what an animal was adapted to eat and what it ate shortly before it died. But to know what it ate for longer periods, scientists have to look deeper — to just below the surface of a tooth — for certain molecular signatures left behind from daily meals. As our teeth grow in early childhood and adolescence, they incorporate certain molecules from the food we eat. The same was true for our ancestors. Paleoanthropologists studying ancient diets are especially interested in carbon molecules in our ancestors' teeth, because they come from plants and stick around for a long time. Some groups of plants use mostly one form, or isotope, of carbon. Plants with C3 isotopes are usually found in fruits and leaves — things that grow in forests. Plants with C4 isotopes, like grasses and sedges, grow in savannas. Data from isotopes confirmed that Lucy's species switched from forest foods to savanna foods about 3.5 million years ago. That transition from forests to grasslands may have played a key role in human evolution, explains Matt Sponheimer, a paleoanthropologist at the University of Colorado, Boulder. Some researchers even think that adding more grass to our diets gave our ancestors more foods to eat and places to live as the early climate changed causing Africa's forests to shrink. Our understanding of what our ancestors ate has become more complex and richer with time, as scientists have applied newer, more advanced techniques to study teeth. When Mary Leakey dug the 2 million-year-old human ancestor Paranthropus boisei out of Olduvai Gorge in Tanzania in 1959 year, she noticed the fossil's wide, thick molars. The skull had huge cheekbones to accommodate strong chewing muscles and powerful jaws, suggesting the species was well-suited for crushing nuts. 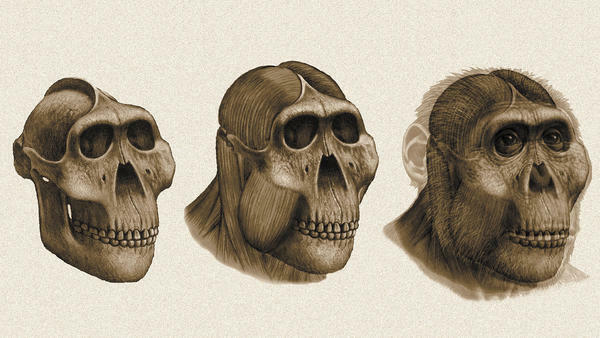 So, Paranthropus boisei was nicknamed Nutcracker Man. But when Peter Ungar and others examined Nutcracker Man's teeth, they barely found any foodprints, so they decided he likely ate soft foods like fruits. An analysis of Nutcracker Man's tooth isotopes revealed C4 carbon, which comes from savannas, not fruit-filled forests. Today, researchers think that Paranthropus boisei ate a varied diet with lots of different foods, but he mostly ate tough grasses and sedges. Teeth from more recent fossils reveal more because they have more isotopes preserved in them. For example, the nitrogen in the teeth of Neanderthals can reveal whether the protein they ate came from plants or animals. It's one of many reasons researchers think Neanderthals hunted large mammals, though scientists have also found fossilized plants stuck in Neanderthal teeth. Researchers were even able to use isotopes to find out when one Neanderthal started weaning her baby. As teeth grow, they lay down layers of enamel. And barium, a molecule children get from breast feeding mothers, builds up in baby teeth until the mother stops nursing. By comparing barium in a Neanderthal tooth with levels in donated present day baby teeth, the scientists were able to find out that the Neanderthal baby had been weaned at about seven months. We can even use teeth to tell if someone moved between places with dramatically different foods or soils. Since wisdom teeth are the last adult teeth to come in, comparing them to an early emerging canine tooth can give scientists a dietary snapshot across time. Say someone was born in Africa and moved to a new continent as a preteen, while wisdom teeth were still growing. A comparison of the isotopes in the teeth would reveal the story of that migration. There's still a lot to learn from teeth, and a lot of fossil teeth still being discovered, says Sponheimer. And as the tools to study them get more sophisticated, teeth are providing a richer picture of "who we are and how we came to be," he says.